The rumor mill keeps on churning. The (first) MLB trade deadline is almost here. With just hours left before Tuesday's non-waiver deadline (teams can still make trades in the month of August after passing all players involved through waivers), the Phillies — losers of three straight to the last-place Reds — may make another move or two. After acquiring Asdrubal Cabrera to man the infield and hopefully provide a little pop in the batting order, the outfield and pitching staff appear to be worthy of upgrading. The Phillies were gun-shy with Manny Machado, Zach Britton and a handful of other players they had reportedly been interested in, so a report by FanCred's Jon Heyman that the team is trying to trade for Mets hurler Zach Wheeler may be a bit of a reach. Even still, it's in the rumor mill. 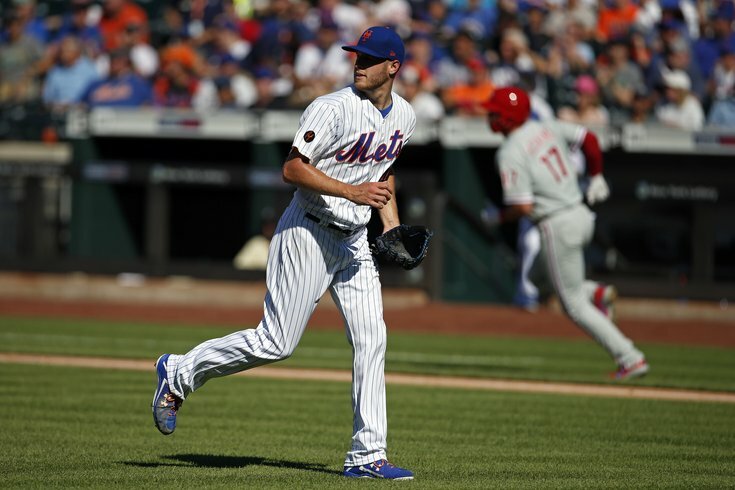 Philadelphia knows Wheeler well from their duels in the NL East, and like veteran pitcher (and former Phillie) Cole Hamels, he seems to be a guy who could use a change of scenery. Wheeler has a 4.11 ERA and 5-6 record this year but has won his last three decisions and looks to be pitching better. He burst on the scene back in 2013, but missed two entire seasons due to injury and since has not been quite the same pitcher he was. The Phils outfield lacks depth but not talent, as Rhys Hoskins, Odubel Herrera and Nick Williams all appear to have found their summer swings and are all producing well. But a fourth outfielder would be a nice thing to have as the dog days of summer drag on. Enter 24-year-old Gallo. He's young, which the Phillies like, but also expensive — which they have shown they don't. Dallas' Evan Grant reports that the Phils and Indians are kicking the tires on the slugger, who hit 41 homers last season and spent his pro baseball youth as a top 10 prospect. However, he has trouble hitting for average. Last year he hit just .209 and is hitting at a .191 clip as of right now. He has 26 homers thus far in 2018 but also 142 strikeouts in 343 at bats. Whether he's a good fit for the equally strikeout challenged Phillies is something we'll have to wait and see. We wrote a few days ago about the Phillies' reported interest in speedy outfielder Adam Jones, and it appears the rumor was true. However, the veteran has a no trade clause and didn't want to move up the I-95 to the first place Phillies. At least not right now. there was a chance to go to Philly, but Adam Jones has decided to stay in Baltimore (at least for now) due to reasons of family, friends, fans and his charity. can't blame him for that. tough call, he appreciates the interest. possibility to revisit after the deadline also. Among the names mentioned by MLB insider Jim Bowden Monday are Marlins ace closer Kyle Barraclough and former Phils' lefty Jake Diekman. It seems to be consensus of those in the know that the Phillies will do what they can to get a top-notch reliever before the deadline passes. contenders still seeking relief: red sox, braves, cubs, mariners, phillies, pirates, dbacks, dodgers. many mentioned on market: yates, kela, iglesias, diekman, steckenrider, barraclough, conley, clippard, avilan, loup, givens, romo, alvarez, duke, ziegler, avilan, axford, rodney.